A grand reception was accorded to Ms. Susan Grace, the Australian Consul General, and Mr. Munish Sharma, Trade Commissioner & Consul (Commercial), Australian Trade and Investment Commission (AUSTRADE), Chennai, by Mr. C. Sarat Chandran, Director, Mr. Ravi Viswanathan, President, and Mr. Prakash Challa, Vice President of the Indo-Australian Chamber of Commerce (IACC), and Chairman & Managing Director, SSPDL Ltd., in the city on March 20. 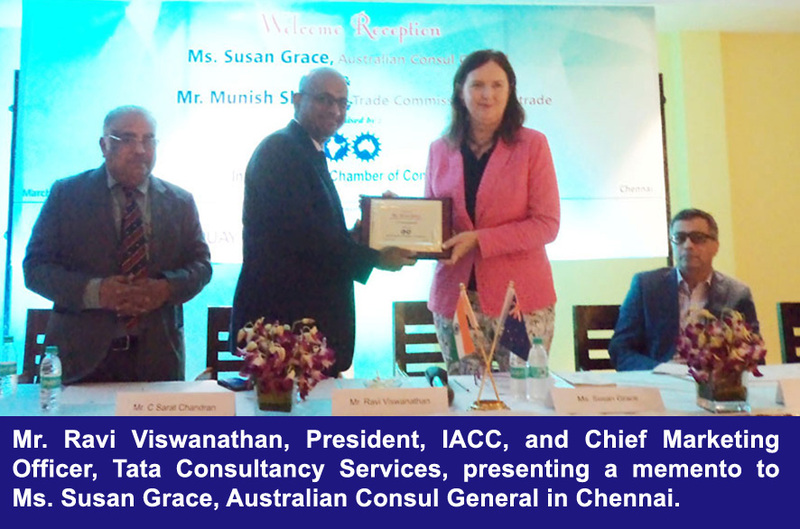 The Australian Consulate in Chennai was established in 2006, and in these 12 years, Ms. Susan Grace was the 4th Consul General. On the occasion, she spoke of the transformation and synergy between India and Australia in education, health, IT, energy, water conservation, transport, agri business and mining. In his address, Mr. Munish Sharma, the 5th Trade Commissioner of AUSTRADE, said his priority is smart infrastructure in South India for transportation and urban building. The cities in Australia like Canberra, Sydney, Melbourne, Brisbane, Tasmania, Perth, Adelide and Queens Land have lots of Indians settled in various industries, and the business co-operation between India and Australia nurtured growth and co-operation between the two countries. The Australian Government appreciated the Prime Minister, Mr. Narendra Modi’s novel steps to build relations between the two countries. Of significance in the context is the recent meeting of the Tamil Nadu Chief Minister, Mr. Edappadi K. Palaniswami, and the Australian Consul General and Trade Commissioner, for signing an MoU on road safety and sea foods along the Tamil Nadu coastline. He also said that his endeavour would be to promote better relations between south India and Australia. 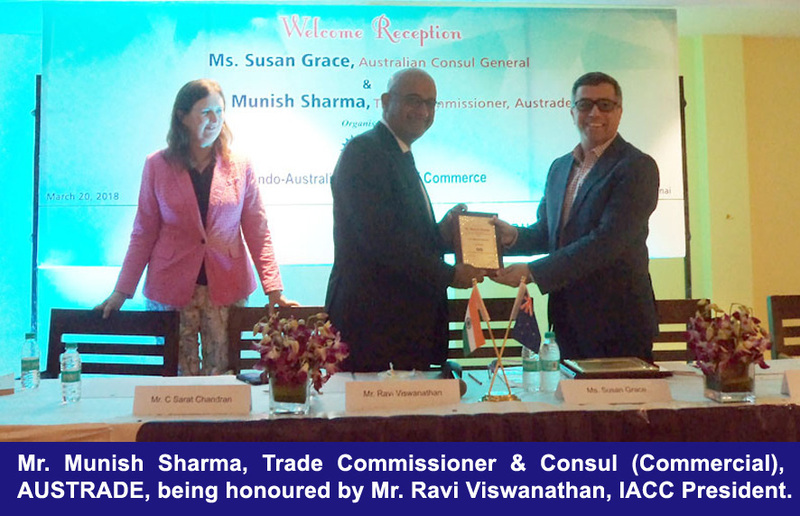 Earlier, welcoming the gathering, Mr. C. Sarat Chandran, Director, IACC, and the driving force behind the growth of Indo-Australian bilateral trade, outlined the various initiatives taken by the two countries for trade promotion. Mr. Prakash Challa proposed a vote of thanks.